Our Cover to Cover Book of the Month for February is A Big Guy Took My Ball! by Mo Willems. Someone took Piggie’s ball and he is BIG! What should Piggie do? This book provides a great opportunity to discuss with your child positive ways to resolve conflict. Get creative! Explore the many possibilities to positively resolving conflict! 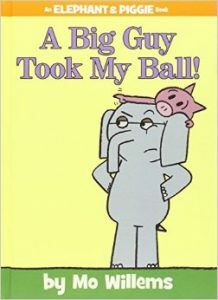 Getting Piggie’s ball back from the “Big Guy” shouldn’t be a problem for such a BIG elephant like Gerald. But things aren’t always what they seem. Talk with your child about the assumptions made in this book and how they led to a BIG misunderstanding. How did Piggie and Gerald resolve the conflict? Promote phonological awareness by singing Willoughby Wallaby Woo with your child. This silly elephant song will definitely get your little one recognizing the diverse sounds of language. Find the lyrics here. Send a picture of you and your child playing ball together. Be creative! We can’t wait to see what you loved about A Big Guy Took My Ball!